Successfully Added Digital Camera Photo Bank - Storage and Memory Card Drive to your Shopping Cart. 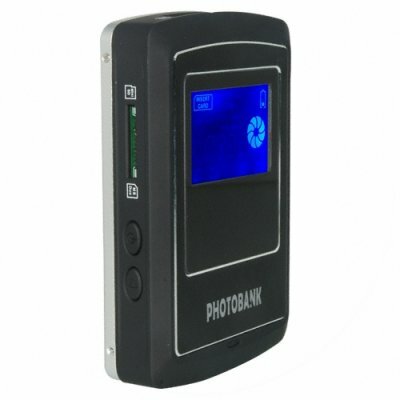 Portable photo bank, digital media storage and memory card reader for user-enabled high capacity data storage, with the ability to directly read and copy files from 10 different memory card types. Featuring a large backlit LCD display and one touch copy function, this mobile storage drive is the perfect device for anyone constantly taking pictures or on the move. For those who enjoy taking videos or going on long vacations, this multi-media storage bank is an elegant and light weight solution for offloading pictures and videos while on the road. This digital data center is compatible with 2.5 inch Hard Disks up to 160GB and works with all file types. The package includes all the necessary accessories and drivers for Windows and Mac computers. Finally, a truly valuable product for the hard to please gadget freak. Everything that anyone could possibly want for Portable Digital Storage is easily available at a low wholesale cost and with no minimum order quantity (M.O.Q. ), direct from Chinavasion Electronics. Note: This product is not sold with a Hard Disk included. You will need to purchase a hard disk separately. Also please remember to format your hard disk to work with your computer operating system. If you wish to make comments or reviews about this product, please use the product review. Please feel free to open a inquiry ticket if you have questions about this product..